I am reminded that it will be my attitude which determines, at the end of the day, whether it has been a “good” or “bad” day. We all face our share of challenges every day, and it is our attitude toward those “challenges,” more than anything else, which will determine the effect those challenges will have on our day … and, on the way others will view us. As we’ve written, we don’t spend a lot of time promoting our online store, through any of our “social” outlets, as the purpose is never about us. Our sole intention will continue to be to bless, encourage, and inspire others, through whatever means we have. I feel that this is a great way, a great attitude to have as we face a new day: How can we bless others today? How can we show God’s love to those around us? How can we witness to others … through our actions-and our attitudes today? Which leads us to the actual artwork entitled “Begin a New Day.” This is where this series began, and it will conclude with the words and art featured on our online store. Great art should always inspire us … and, make us think. In this case, just this one art print has led to five different posts, and several pages of writing. And, a lot of thinking. It reminds us that every day is a direct gift from God. A gift, freely given to us. What are we going to do with it? 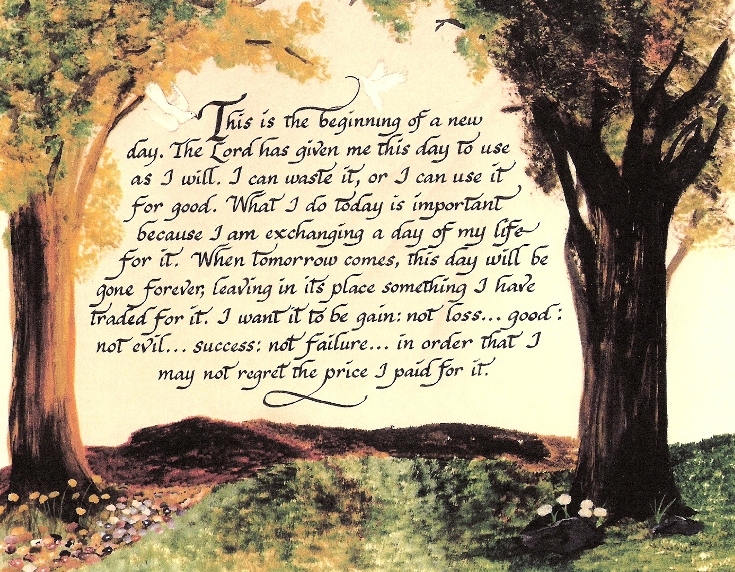 We’ll never get this day back … so, each day carries with it a tremendous price paid for it … will we use it for positive or negative? It speaks again to so many posts we have written, that the best way to start the day … is to go to the One who has given you this gift. We are honored and privileged to be allowed to serve others with messages like this one. We greatly appreciate those who tell us they stop by just to read the art, to be encouraged and blessed. That’s what the artwork, that’s what “the business” is all about. This entry was posted in BEGIN A NEW DAY, SUCCESS: NOTES, QUOTES, & FOLKS and tagged BEGIN A NEW DAY, Christian art, words to begin the day. Bookmark the permalink.